The participants of the first Student Awards competition were asked to deliver a 10-page paper contributing to the understanding of how DHC and kindred technologies can be used to improve the efficiency and sustainability of heating and cooling on a local, national or international level. The DHC+ Secretariat received 7 contributions from universities in Austria, Denmark, Finland, France and Sweden. The submitted papers deal with quite different issues and approach DHC from technical, legal and economic points of view. The DHC+ Education & Training Working Group served as evaluation committee. The members assessed the contributions based on a predetermined scheme taking into account the importance of the contribution, its methodology and inner logic and the clarity of presentation. The high level of excellence made it a difficult evaluation process. However, the committee came to the following conclusion. Kaisa Kontu, Tingting Fang, Risto Lahdelma from Aalto University, Finland for their paper ‘Forecasting District Heating Consumption Based On Customer Measurements’. Matthias Schafhauser from Technische Universität Wien for his paper ‘Test system design and measurements of thermal conductivity for composite pipes’. 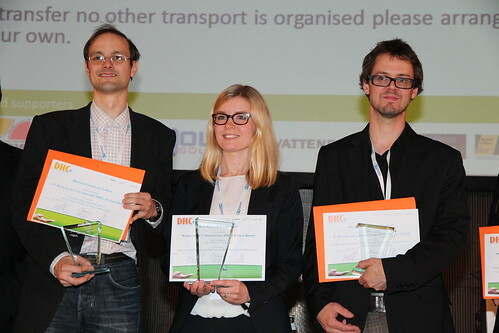 All winners presented their findings during the award ceremony at the Euroheat & Power Congress in Vienna (27-28 May). The ceremony was moderated by Ulrika Jardfelt (Svensk Fjarrvarme), accompanied by Yves Delaby (DHC+ chairman) and handed over by Marc LaFrance (IEA). Also, the winning contributions were published in the International EuroHeat & Power Magazine. Additionally, the group of students that became first received a research contribution of EUR 1000.